Truly some of my favorite books!! I am almost sure that Janette Oke's Love Comes Softly series was one of the first "grown up" books that I read as a young teenager. I rarely reread books -- once is usually plenty for me. However, I have lost count of the times I have reread this particular set of books. 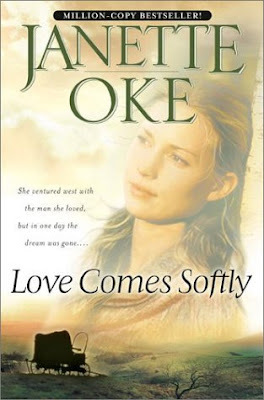 Oke's Love Comes Softly series is like an old friend to me. I feel like I know and love the characters. I almost know the words by heart! :-) Yet even though I know the plot and storyline, I STILL laugh and cry in the same places. The books are well-written and I just love them! Now as for the movies that have also come out based upon Oke's books: Hm! If you want to watch a clean, family movie, then they're okay. But, based on the books?! Hardly!! Remember, I said I know the books almost by heart?!! About the only thing true in the movie that holds to the book is the character NAMES of Clark and Marty. Eh, it's my personal review! You READ THE BOOKS FIRST...then, watch the movies. Decide for yourself!! And, I'm going to give you a chance to read the book first! I'm giving away a copy of Love Comes Softly. To enter (and qualify for other entries), leave a comment on this post telling me what your favorite book or who your favorite author is! Be sure you leave your email, or have email enabled in your profile, so I have a way to contact you if you win! Follow me or subscribe via email, and comment telling me so! Blog about my giveway, and comment with a link to your post! Entries will be accepted until October 22. Happy, happy birthday! I hope it's a wonderful day and a fabulous year for you and your sweet family! Visiting from SITS......have a good one! Not entering the giveaway, but just wanted to stop by from SITS to wish you a Happy Birthday! Hope you're having a wonderful birthday. Just stopped by from SITS to say hi. I can't think of a "favorite" book right now, but one of my favorite series is the Californian series by Lori Wick. I think I've read those books at least 3 times each, which is a lot for me to reread books. My absolutely favorite book is my Bible. My favorite fiction writer is Francine Rivers. I love all the books I've read of her's. Some include: 'Leota's Garden', 'Redeeming Love', 'The Atonement Child', 'And The Shofar Blew' and 'The Scarlet Thread'. I've still got a long ways to go to read all of the ones she has written, but I'm working on it! I'd really love to read this series. I know Ms. Oke is a really great writer, too. I've seen some of the movies based on these books, and they are great, but I know movies never do books the justice they deserve. Thanks for the chance to win! I am now one of you 'Followers'! I have subscribed to your blog via email AND confirmed the subscription. Wow. This looks like a great book. Please include me in the giveaway. Thank you. And my favorite book... I have so many. Some of my favorite authors are Lynn Austin, Denise Hildreth, Lori Wick, and Laura Frantz is a good one too. My favorite book can be one by one of those authors. Please enter me. Thanks for the chance. My fav author is Charlaine Harris. My favorite author at the moment is Nicholas Sparks. I absolutely LOVE the movies that go along with his books!! I LOVE Pride and Prejudice by Jane Austen, IT is a classic and my fave! My favorite book is "Coming up for Air" by Margaret Becker, however my favorite all-time author has got to be Janette Oke! My favorite author is C.S. Lewis. I love The Chronicles of Narnia. Jodi Picoult and Sandra Brown! I agree: read, then watch!! I really like Lynn Austin. If you like Oke, you'll like her. Wow, what a hard question. My favorite book is Woodhouse Family Welcome Home! Our Family's Journey To Extreme Joy by Kim Woodhouse. It's a great book. And my favorite author is Robin Jones Gunn. I'd LOVE to read this book. Janette Oke is a wonderful author. I loved the movie. I hate to admit...but I'm also a Twilight fan! My favorite author is Karen Kingsbury and I love Even Now and Ever After by her. My favorite author is Robert Whitlow (I am a little biased because I know Robert!) but I do love Janette Oke's books as well. I have read many of her books. They are very well written and I love her story lines. Ok I'm a Jane Austen fan. Pride and Prejudice is sooooo excellent even the 4th and 5th time! And thank goodness the BBC movie is quite true to the book. Love it. I just finished reading Eve: a novel of the first woman by elissa elliott...excellent!! One of my favorite books is Fried Green Tomatoes at the Whistlestop Cafe by Fannie Flagg. I found the first book when I was 12 years old while on vacation at the Oregon Coast. I think it was the first book I bought with my won money. I fell in love with the series then and I still love it now. Yes the movies were not the same but they did have some good moments. I do wish they were a bit more true to the book. Glad others love it as much as I do.